Adjusting Medicare payments to hospitals based on where they are located is not necessarily a good idea, according to the Institute of Medicine (IOM). While some states unquestionably have higher costs, a new IOM preliminary report notes that providers, not states, make health care decisions and that financial incentives to manage costs more effectively should be directed at individual providers, not at geographic areas. The IOM study of the potential of adjusting Medicare payments based on geography was undertaken at the request of Health and Human Services Secretary Kathleen Sebelius in 2010. 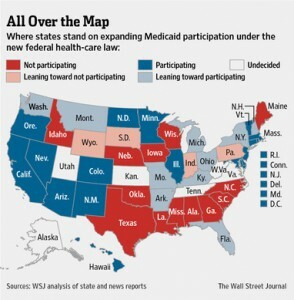 Which states have decided to go ahead and expand Medicaid eligibility, as provided for in the Affordable Care Act? Which have decided not to expand? Which still haven’t decided or are still on the fence? See which are which below on a map that appeared in the Wall Street Journal. Immigrants to the U.S. – legal and not – pose a special challenge in the health care environment of the future. Legal immigrants will not be able to benefit from many of the Affordable Care Act’s provisions until they have resided in the U.S. for five years while undocumented residents will not benefit from the reform law’s Medicaid expansion at all. Meanwhile, many of these individuals will continue to turn to health care providers, and especially to hospitals, when they are sick or injured. But is this is a problem? And if it is, how great a problem is it? How many such individuals are there? The Medicaid and CHIP Payment and Access Commission (MACPAC) has issued its March 2013 report to Congress. The agency, created to advise Congress on Medicaid and Children’s Health Insurance Program (CHIP) issues, offered two recommendations in its report. First, it recommended that Congress authorize states to implement 12-month eligibility for adults enrolled in Medicaid and children enrolled in CHIP, in much the same manner as they now do for children enrolled in Medicaid. And second, MACPAC urged Congress to fund permanently Transitional Medical Assistance (TMA), which enables families that become ineligible for Medicaid because they now earn more money than the program’s limit to retain their Medicaid eligibility for several additional months. The MACPAC report also includes analyses of several issues involving services for dually eligible (Medicare and Medicaid) individuals. In their desire to persuade states to expand their Medicaid programs as called for in the Affordable Care Act, federal officials are now suggesting that states could use new federal Medicaid funds to enable Medicaid-eligible people to purchase private insurance. Even though this was not envisioned in the health reform law, the prospect of making greater use of the private sector appears to be appealing to many Republican governors who have otherwise been reluctant to commit their states to expanding their Medicaid programs.